The NFDA Convention is in Full Swing! The NFDA Convention at the Indiana Convention Center in Indianapolis, IN this week has been busy for our Sales ManagerLinda Murphy-Kreimes! 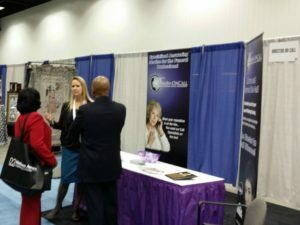 Lots of people have been stopping by our Booth to learn more about ourFuneral Home Answering Serviceand whatwe can do for Funeral Homes(see picture at right). Please stop by and visit us at Booth #569! Even the younger ones found things to do at the Convention! (See picture at bottom).